According to the Bureau of Labor Statistics, the expected job growth from 2016 to 2026 for high school teachers is 8% and elementary and kindergarten teachers is 7%. Although this job growth is as fast as average, there remains competition for the best teaching jobs. When you apply for one of these jobs, you most likely contend with tens or even hundreds of other applicants with similar qualifications to yourself. Your resume acts as your introduction to the hiring manager, so you must have a strong one to stand out from this competition. Using our teacher resume templates and the accompanying writing guide can give you the head start you need to develop a standout resume to help you with your job search. Why Use Teacher Resume Templates? Inspiration: Struggling to find the right skills or job duties to include? Review templates and examples to find inspiration for your content. Is teaching your second or even third career? Do not let that stop you from successfully applying for the job you want, even if it is highly competitive. With changing career teacher resume templates, you can learn ways to craft your resume in a way that emphasizes the qualifications and skills from your previous jobs that only strengthen your fit for the position. Chronological resumes remain the standard format in many industries. In this type of resume, you list your work experience and accomplishments in chronological order, generally starting with your most recent and working backward. This works well for those with a long work history, especially one without major gaps. Because many hiring managers prefer it, most jobseekers choose to use chronological teacher resume templates. Modern teacher resume templates combine clean and professional formats with a hint of creativity. They give a sense of your personality without alienating the hiring manager. You can use them in almost any industry to demonstrate your attributes as well as your personal style and technical acumen. These types of resumes work very well for instructors of computer science, information technology, and/or creative subjects. If you read through articles on how to write a resume, you generally see the tip to keep your resume to one page. When you have an extensive background, you might struggle to do so. Our one-page resume templates provide different ways by which to keep your resume to one page without having to sacrifice pertinent information that improves your application's chances. There is a lot of debate as to whether you should include a cover letter, and many jobseekers prefer to just forgo it to make it easy. However, cover letters still matter to many employers. Rather than struggle with drafting a letter, choose teacher resume templates with cover letters that start the process for you. Although using teacher resume templates take you a long way towards writing a strong resume, you should know the basics about what to include in your document. Although most of our templates include the following sections, you want to proofread your resume to ensure it has all the key components. Here are also some writing best practices to help you compose the content. List all relevant degrees, courses taken, and continuing education. However, there is no need to include a high school diploma if you have a college degree. Want an easier way to create your initial draft for your resume? 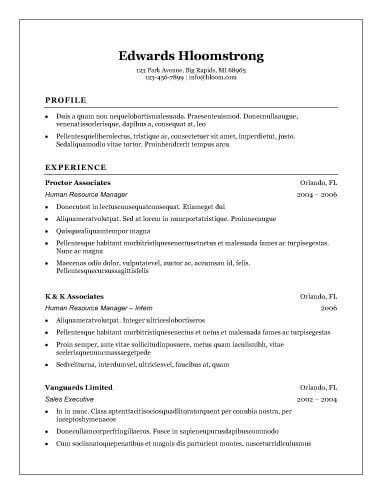 A resume builder might provide the right answer. Similar to teacher resume templates, resume builders provide structure, formatting, and inspiration for content. Unlike templates, in which you input your information into an already-created document, you answer a series of questions and the builder does the rest. You still must edit and tweak the product, as the syntax and jargon might not sound natural, but it generally provides an excellent starting block. Although the builder creates your resume, it still requires information from you. Therefore, it is best to prepare prior to sitting down to work with the builder.